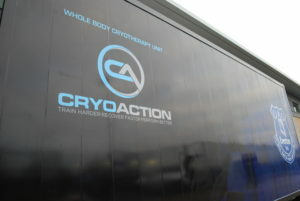 CryoAction is a specialist provider of whole body cryotherapy equipment to elite sports. Serving a wide range of sporting disciplines, CryoAction have quickly become the provider of choice to medical teams and physiotherapists. Working with leading partners in the sector, ranging from the leading cryotherapy equipment manufacturers in the industry, the UK’s largest liquid nitrogen supplier through to asset finance specialists, CryoAction possess an unrivalled range of products and services to suit all whole body cryotherapy needs. All equipment sold by CryoAction meets the highest qualifications in manufacturing and safety. The manufacturing is undertaken to ISO 9001:2008 standards and the patented whole body cryotherapy chambers hold the highly sought after EC Certificate under the Product Quality Assurance System approval under Annex VI of the Directive 93/42/EEC on Medical Devices. Based in the United Kingdom, CryoAction is a private company owned by its two co-founders and shareholders. Offering a wealth of experience from across sports and business, the directors are seeking to deliver a strong commitment to innovation, service and customer service, all that our clients need to maximise their return on investment in our systems. Complete turnkey solutions, taking your cryotherapy project from concept through to delivery and full exploitation. Site inspections and liaison with architects and civil engineers to ensure integration into training facilities. Full training and best practice passed on by industry leading experts and medical staff. Partnership with BOC to ensure optimised delivery of liquid nitrogen. Full backup and access to service and maintenance.